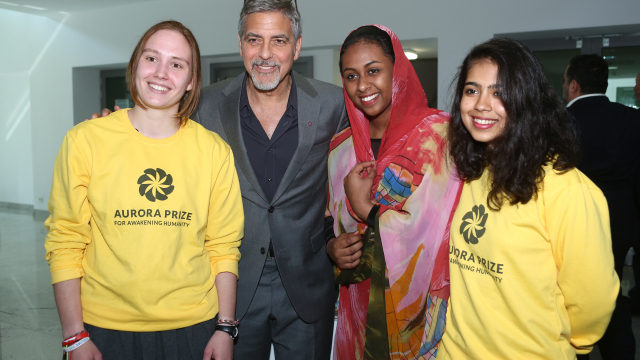 Students participated in a Q&A with Mr Clooney and Ruben Vardanyan, co-founder of both the Aurora Prize and UWC Dilijan College. Mr Clooney met Pamela Tebchrany, the first recipient of an annual scholarship granted by 100 LIVES in the name of Amal Clooney. The Amal Clooney Scholarship offers one female student from Lebanon a place on a two-year international baccalaureate program at UWC Dilijan. Recipients will be chosen annually based on their exemplary academic performance and demonstrable interest in the promotion of human rights and international issues. Télécharger tout ... Qu'est-ce que c'est? UWC Dilijan College opened in October 2014 in Dilijan, Armenia. It is an international boarding school of the UWC education model comprised of 190 students from 64 countries studying a two-year IB programme. The college offers full scholarships to 48% of its students, and a further 50% of the student body receive partial scholarships (covering 67% of tuition fees on average). UWC Dilijan was established by Ruben Vardanyan and Veronika Zonabend with the support of other Founding Donors.